The UHF Radio System is a customizable communications solution that enables radio communication throughout the vessel. The system is composed of TX/RX stations, antennas, splitters, and portable UHF radios. 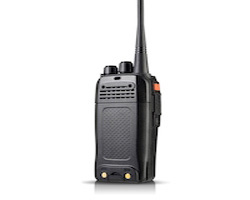 Explosion-proof radios are available for operation in hazardous areas. Primary benefits: Antenna networks can be designed to provide ship-wide radio coverage in the presence of metal structures. The system can operate in single or multi-channel modes.